The small, orange EP3 Sonic Defenders Earplugs from SureFire provide an EPA Noise Reduction Rating (NRR) of 24dB, with pass-through double-flanged stems. The stems filter loud potentially harmful noises over 85db while allowing safe, lower-level sounds, such as conversations, to be heard; and for full protection from all sound the attached filter caps can be inserted into the stems. They can also be used as inconspicuous earpieces for compatible radio systems by removing the filters. With the filters removed, the earpieces will no longer protect against noise. Made from a soft medical-grade hypoallergenic polymer, these hearing protectors are comfortable for all-day wear. The EarLock design fits flush in the ear with 7 points of contact to keep them locked in place, and allows them to be worn with helmets and masks, or while using a phone or over-the-ear headset. A detachable 26" polymer lanyard keeps them together and a carrying case is included. 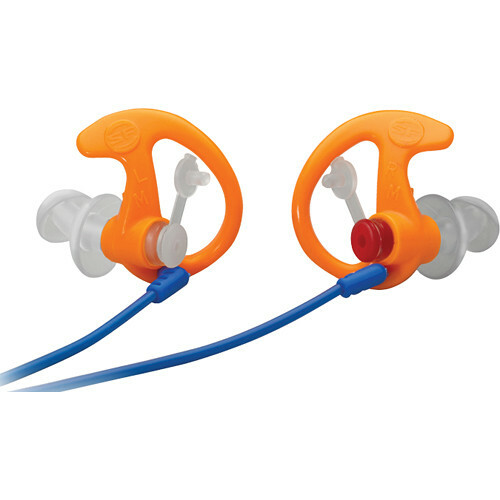 Box Dimensions (LxWxH) 4.4 x 3.4 x 0.9"
EP3 Sonic Defenders Earplugs (Small, Orange, 1 Pair) is rated 4.4 out of 5 by 5. Rated 4 out of 5 by Anonymous from Comfort could be better for the price I will be using these in noisy bars for watching games. I like the color so they don't bring attention that I'm wearing ear plugs. I like the center hole so you can still hear conversations. I bought a size medium first and they hurt my ears because the diameter was too big. I thought the small would feel really good. Unfortunately they still cause some discomfort to my ears but nothing terrible. Rated 5 out of 5 by Anonymous from Good hearing protection I bought these to protect my hearing while shooting trap. They certainly cut down on the loud spikes of noise when shotguns are fired but still allow me to hear conversation. They are not suitable for the rifle or pistol ranges where better hearing protection is required. Rated 4 out of 5 by Anonymous from Had To Buy A Medium Neede these for loud concerts taht I occasionally work, as well as working with power tools in a wood shop. These were uncomfortable, so I had to buy a medium, which is much more comfotable. Rated 5 out of 5 by Anonymous from Great product These work great at filtering out loud noises emitted by aircraft engines, which I work around. At the same time, they allow me to hear normal conversations. Rated 4 out of 5 by photoman12001 from Good but not great I ordered the size small based on measurements recommended on Surefire's website and they don't fit at all. They're so small that they slip right out of my ear and offer no protection. I previously bought a large and they were too big. I should have went with the advice I read online; unless you have really big or small ears, go with the medium. I did use the larges quite a bit though they made my ears sore due to being too big. They were nice for airplanes and drowning out computer server noise where I work. These were both with the stoppers in. I bought them to use while shooting guns but haven't yet. Due to their low decibel rating I'll probably use them under earmuffs. With the stoppers out they didn't seem to do a good of blocking loud, sharp noises like hand claps by the ears or yelping so I don't think I'd trust them with gunshots. However, these tests weren't scientific so I don't know if they broke the 85 decibel threshold. The disposable polyurethane plugs seem to be as comfortable as these and offer better protection (according to decibel ratings). Where the Surefires have an edge is the ability to clean and reuse them easily. I think they're worth the money for that reason but I wouldn't say these are much better than foamy types otherwise. For the money I do wish they came with a better storage case.